In a radiology suite under fluoroscopy (which creates moving rather than still x-ray images), the patient is asked to swallow barium in thin liquid and paste consistencies, and then in paste on a cookie or cracker. 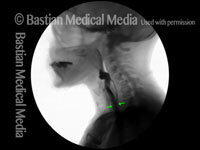 The barium bolus is followed radiographically through the mouth, throat, and into the esophagus. Both lateral and anterior–posterior views are recorded and, depending on the facility, a simple screening sequence of the subsequent movement down the esophagus is also recorded. 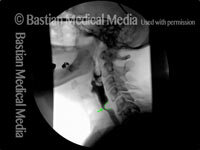 This video presents a clear visual example of a barium swallow, a test that involves having the patient swallow a barium solution while using x-rays to observe the flow of the barium, which can reveal swallowing deficiencies. This video shows x-rays of barium passing through the throat, first with a narrowed area caused by a non-relaxing upper esophageal sphincter (cricopharyngeus muscle), and then after laser division of this muscle. 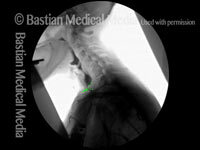 Preoperatively, food and pills were getting stuck at the level of the mid-neck, and the person was eating mostly soft foods. After the myotomy (division of the muscle), the patient could again swallow meat, pizza, pills, etc. without difficulty. 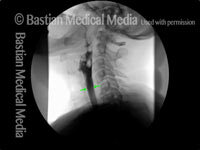 This entry was posted in Multimedia Encyclopedia and tagged Disorders, Photos, Procedures & tools, Videos by admin. Bookmark the permalink.